You've decided to give AlterCam a try, but you're not sure where to begin. No problem! We're here to help. As you know, AlterCam allows you to modify the appearance of your webcam stream. But did you also realize that you can make those changes in real-time as the video stream is happening? 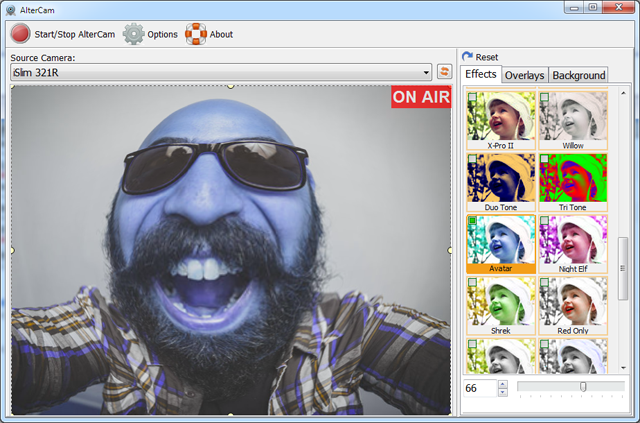 AlterCam features a wide variety of graphics, filters, and visual effects that can be applied before and even during a webcast. Real-time or offline the choice is yours. If this is your first time using AlterCam, begin by launching your primary webcam client; Skype, Facebook Chat, Google Hangouts, etc. Next locate the options - sometimes called "preferences" - inside your webcam client and let it know that you want to use AlterCam instead of the regular webcam – (you’ll still be using your normal webcam, just giving AlterCam permission to modify how things appear on the screen visually). Once your webcam knows to look for AlterCam, you can begin designing different appearances. You accomplish this through a variety of options, each designed to give you more control over the look and feel of your video chat window. You can edit your webcam display both offline and in real-time! 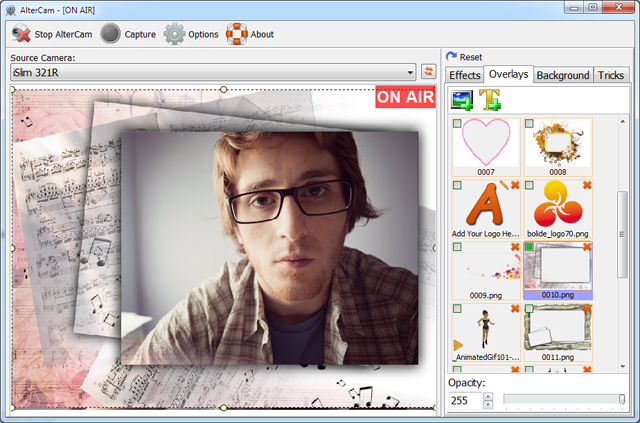 Switch between being "On Air" and off by clicking the Start/Stop button in the top left corner of your AlterCam window. Add effects, overlays, and backgrounds to the display. These options can be found on the right side of the AlterCam window. Click one of the tabs Effects, Overlays, or Backgrounds to reveal options. To apply Effects click any effect that you'd like to use and the change takes place immediately. You can use more than one effect at a time, allowing you to invent entirely new styles. When applying Overlays, there are many options and scenarios to choose from. The Background feature also includes several options. To learn more about how-to apply Backgrounds (add a custom image, select color, or broadcast your desktop)... check out How-to Broadcast Screen with Virtual Webcam. When you're finished, and you'd like to return AlterCam to its default settings click Reset at the top of the options frame.